When your child has trouble at mealtimes, it can make for a lot of daily stress! Not only does eating become stressful, but it could become dangerous. If your child struggles with chewing and swallowing, malnutrition and respiratory issues become a real concern. Whether your child reacts physically with discomfort or choking, avoids eating, or even has trouble breastfeeding, we can help! Feeding therapy has been used with great success to treat these difficulties. Baron Therapy is one of the only practices on the East Coast that specializes in feeding therapy. 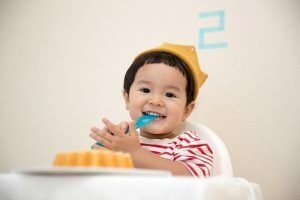 Our experts help children who struggle with eating, chewing, swallowing, and other mealtime activities. We’re qualified to treat the entire range of feeding related disorders. We want to make meals a happy and relaxing time for your family once again, and help your child get the nutrition they need! The first step in providing excellent therapy for your child is an evaluation. When we get to know you and your child and all your needs and difficulties, we can provide an accurate diagnosis. We look at where in the eating process the issues are occurring, and whether or not there is an underlying cause. It could be physiological or a sensory integration dysfunction. With a proper diagnosis, we can develop a custom treatment plan for your child. Our methods are tried-and-true and based on thorough research. And we tailor our methods of treatment to your child’s specific needs. We address the root cause of your child’s challenges. Then we teach them to use their strengths to overcome their weaknesses. By taking a play-based approach, we make it fun for your child to improve. If needed, we may use a more structured method instead, or a combination of both. It all depends on how your child responds. We also provide activities that you can continue to use at home for further benefits. Feeding therapy can be challenging, but we make it fun! The earlier feeding disorders are treated, the better. Early intervention can sometimes completely remove an issue. It also helps prevent further issues as the child grows, goes to school, and becomes an adult. If you suspect that your child may have a feeding disorder, trust your instincts! Schedule an evaluation with one of our therapists. Our feeding therapy services are proven to help children with all kinds of developmental difficulties.